For the final in our series of modern icons of London, we’re looking at the tallest in London (and, at the time it was completed, the tallest in Europe) – the Shard. Based in London Bridge, the 310 metre high skyscraper, was constructed between 2009 and mid-2012, and inaugurated by Qatar’s Prime Minister, Sheikh Hamad Bin Jassem Bin Jabor Al Thani, and Prince Andrew, the Duke of York, in July, 2012 – an event marked by a light and laser show (late that year, Prince Andrew abseiled down the building in a fund-raising effort for charity). 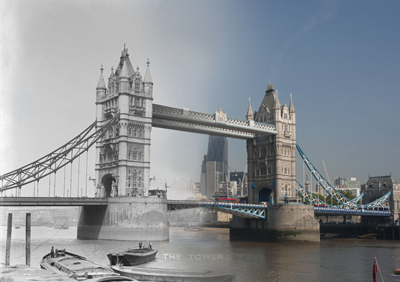 The observation deck of the building – originally known as London Bridge Tower and often referred to as The Shard of Glass – was opened to the public on 1st February, 2013, in an event overseen by the then Mayor of London, Boris Johnson. 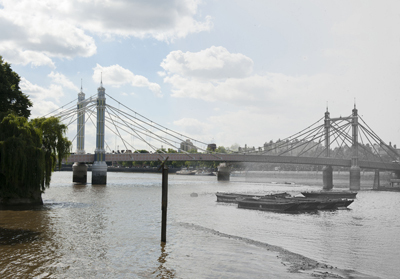 Architect Renzo Piano’s lofty design for the building – first sketched out on the back of a napkin in a Berlin restaurant back in 2000 – was inspired by the London church spires and ship masts as seen in the work of 18th century Venetian painter Canaletto, to appear as a “spire-like sculpture emerging from the River Thames”. It features eight sloping glass walls – the shards – with gaps or “fractures” between them to provide natural ventilation and a tapered structure to give the impression of lightness and transparency as it disappears into the clouds. As well as office space, the building’s 72 habitable floors features shops, restaurants and bars, as well as a hotel – the Shangri-La, and apartments. News organisation Al Jazeera is also based in the building. Located on floors 68, 69 and 72, the visitor attraction, The View from The Shard, offers panoramic views of up to 40 miles from an indoor viewing platform and the open air Skydeck (as well as the view, there are also virtual reality experiences available on the Skydeck for an additional cost). 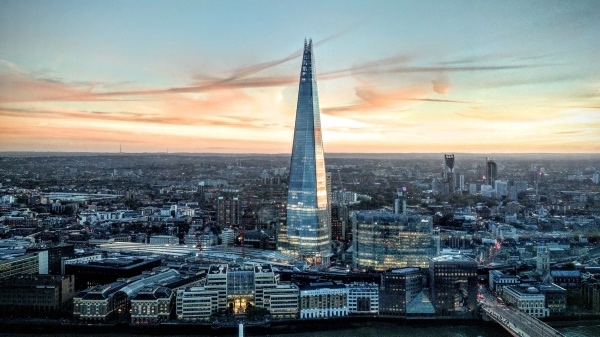 The Shard – which attracted a million visitors in its first year alone – remained the tallest building in Europe until November, 2012, when it was surpassed by Moscow’s Mercury City Tower (it is still the tallest building in the European Union). We’ll be kicking off a new special Wednesday series after Easter. WHERE: The View from the Shard, Joiner Street (nearest Tube station is London Bridge); WHEN: Times vary, so check the website for details; COST: Pre-purchased timed and dated tickets range from £22.95 for adults/£16.95 for children aged four to 15 (check website for further details); WEBSITE: www.theviewfromtheshard.com. 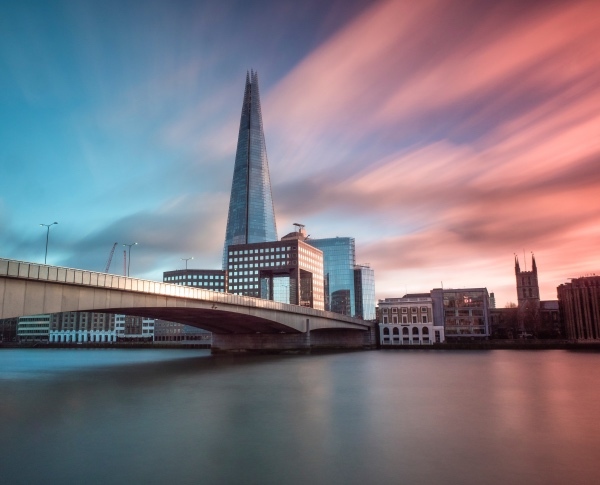 PICTURES: Top: The Shard (Fred Mouniguet/Unsplash); Below – The Shard from the Thames (Matt Holland/Unsplash). 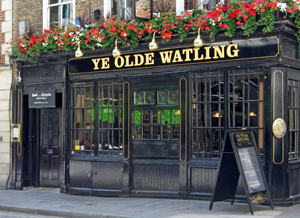 This pub, located in the City, takes its name from the street upon which it stands – Watling Street. The street, which is just 180 metres long, bears the same name as a great Roman road which ran all the way from Dover through London to the long gone Roman town of Viroconium (now known as Wroxeter in Shropshire). The Roman road followed, to some extent, the route of an ancient Celtic pathway. 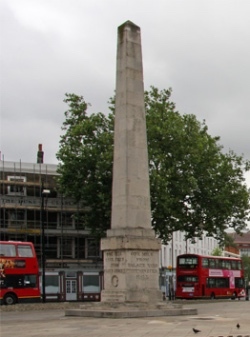 But while the Celtic pathway crossed the Thames at Westminster, the Roman road, once the bridge was constructed, crossed at London Bridge and headed through London, apparently taking in this surviving piece. 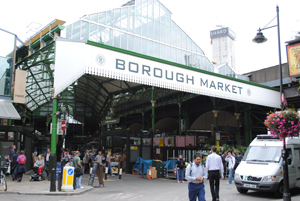 The building itself – located on the intersection with Bow Lane – is said to have been constructed from old ship’s timbers by none other than Sir Christopher Wren in 1668. The upstairs rooms were said to have been used as a drawing office during the construction of Wren’s masterpiece, St Paul’s Cathedral. 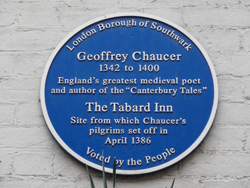 It may have also been used as pub by the workmen building the cathedral – in fact it’s said to have been the first pub built after the Great Fire of 1666. The pub is part of the Nicholson group. For more on it, check out www.nicholsonspubs.co.uk/yeoldewatlingwatlingstreetlondon. Perhaps not so much a sign as a pub name, the strangely monikered Doggett’s Coat and Badge in South Bank is named after a rowing race – said to be the oldest continuous sporting event in the country – in which apprentice waterman traditionally competed for a prize consisting of waterman’s coat and badge and named after Irish-born actor and theatre manager, Thomas Doggett. The race – which is held in July and runs over a course of four miles and seven furlongs from London Bridge to Chelsea (the starting and finishing points were originally both marked by pubs called The Swan) – was first held in 1715 when it was first organised by Doggett who financed it up until his death in 1721 after which he left instructions in its will for it to be carried on by The Fishmongers’ Company (which it still is today). 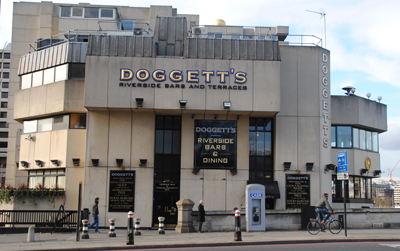 While there’s a nice story that Doggett, who managed the Drury Lane Theatre and later the Haymarket Theatre and carving out a name for himself as a ‘wit’, started the race as thanks to Thames watermen for rescuing him when he fell off a watercraft while crossing the Thames, Doggett – a committed Whig – actually started the race to commemorate the ascension of King George I – the first ruler of the House of Hanover – on 1st August, 1714, following the death of Queen Anne. 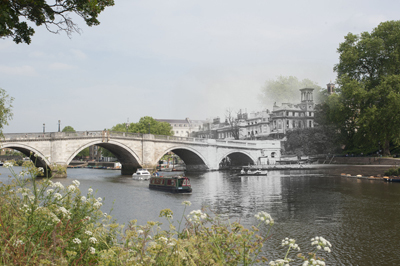 This year’s race winner was Merlin Dwan (London Rowing Club) who beat four others to finish in 24 minutes, 28 seconds. The pub, one of the Nicholson franchise, is located in a multiple storey modern building complex and sits along the course of the race in South Bank. It features a range of bars including Thomas Doggett’s Bar and the Riverside Bar as well as a dining room and other function rooms. For more on the pub, see www.nicholsonspubs.co.uk/doggettscoatandbadgesouthbanklondon/. For more on the race (which we’ll be mentioning, along with more on Thomas Doggett, in more detail in upcoming posts), see www.DoggettsRace.org.uk. 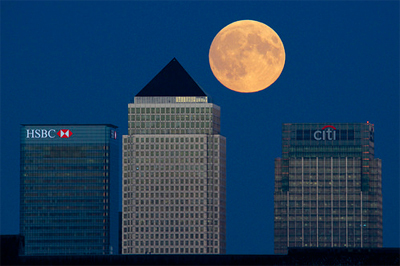 • Europe’s tallest building marks the completion of its exterior structure today with a spectacular light show. 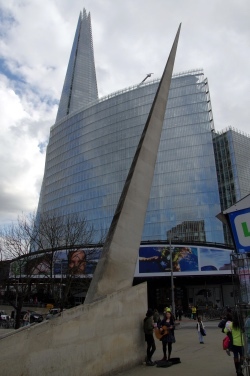 The Shard, a £450 million development located over London Bridge Station in Southwark, stands 310 metres tall and was designed by Italian architect Renzo Piano. The controversial glass clad structure, work on which commenced in 2009, features a jagged top with the design reportedly referencing the city’s many church spires. 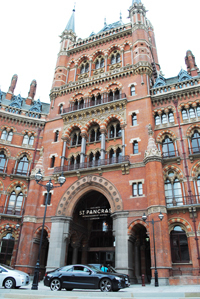 While the exterior of the building is now complete, work is expected to continue on the building’s interior – which will contain offices, luxury shops and restaurants, a five star hotel and 10 top-end apartments (the highest in the UK) – until next year. It is expected that the building’s viewing decks – which offer panoramic 360 degree views over the city – will become a major new tourist attraction in the city. The Shard will be formally opened today by Qatari Prime Minister Hamad bin Jassem al-Thani and Prince Andrew, Duke of York. The hour long light show, which features lasers and searchlights, kicks off at 10pm and those who can’t see it in person can watch it streamed live at the-shard.com. 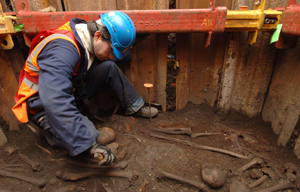 • A skeleton from the St Bethlehem Burial Ground and 55 million-year-old fragments of amber are among the artefacts which will go on display this Saturday at a special public exhibition of archaeological discoveries made during the construction of Crossrail. 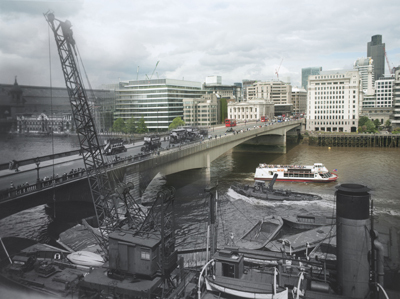 Almost 100 objects found at 10 different sites will be in the Bison to Bedlam – Crossrail’s archaeology story so far exhibition which marks the halfway point of the Crossrail archaeology program, first launched in 2009. Finds have dated from prehistoric times through to the Industrial Revolution and, as well as those aforementioned, also include some medieval ceramic wig curlers, 17th century gravestone markers and stakes made out of animal bone. All the items will be eventually donated to the Museum of London or Natural History Museum. The exhibition will be held from 10am to 5pm this Saturday at the Music Room, Grays Antiques, 26 South Molton Street (nearest Tube station is Bond Street). For more, see www.crossrail.co.uk. 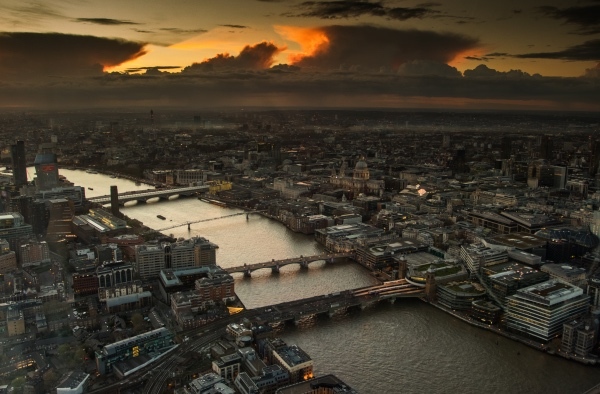 • Alderman Jeffrey Evans (Ward of Cheap) and Nigel Pullman have been elected the new sheriffs of the City of London in a poll held late last month. 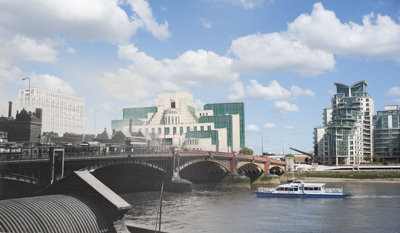 The office of the sheriffs dates back to the Middle Ages – current duties include assisting the Lord Mayor of London in his official duties and attending sessions of the Central Criminal Court at the Old Bailey. The two new sheriffs take up their post in late September. • On Now: Blackpool: Wonderland of the World. A new exhibition held in the Quadriga Gallery at the Wellington Arch, Hyde Park Corner, this looks at how Blackpool transformed in the 19th century from a small village to become became the first resort in the world to cater for the working classes. Focusing on two of the town’s key attractions – the Winter Gardens and the Blackpool Tower – the exhibition’s highlights include a silver model of Blackpool Tower dating from 1893, rare Victorian and vintage posters advertising performances by some of the stars who shone there, and early 20th century photographs of the interiors of the Winter Gardens. In addition, two crowns will illuminate the top of Wellington Arch in a taste of Blackpool’s famous light show. Organised by English Heritage in partnership with Blackpool Council, it runs until 27th August. Admission fee applies. See www.english-heritage.org.uk/daysout/properties/wellington-arch/exhibitions-at-the-arch/current-exhibition/ for more. 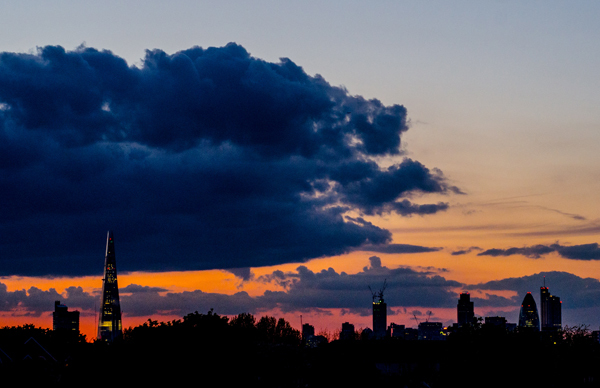 Says the photographer, Ed Walker: “The picture was taken from my girlfriend’s roof garden in New Cross using a 50mm prime lens. I’ve been experimenting with increasing clarity in my pictures to bring out the textures and sharpness especially in landscapes. With the reds, yellows and purples in the sky the cityscape contrasts perfectly.” For more of Ed’s work, follow this link www.flickr.com/photos/spooke/7191263460/in/set-72157629741433536.